Otto Lippolt was a man who loved the land and collected what he loved. Most of what he collected is now town parkland. A native of Massachusetts, Otto F. Lippolt was born in 1891 and moved in the 1920s to a 100-acre farm at the corner of Ridgebury Road and George Washington Highway (the farmhouse later became the Ridgebury Congregational Church parsonage). A well-known and respected well driller and well serviceman, Lippolt was on call 24/7. Lippolt also collected Ridgebury land, especially during the Depression, when many large and long-unused tracks would come up at tax sales. By the 1950s he had amassed more than 700 acres, and began slowly subdividing a small portion that he called Hemlock Hills, which included Old Mill and Bear Mountain Roads. But he was not a cut-and-slash developer. “He knew there’d eventually be a population explosion and that Ridgebury would participate,” wrote Baumhart, a former newspaperman and Famous Writers School teacher. “He meant to see to it that the lovely land he owned went to those who felt much as he did about it. He wouldn’t sell to just anybody. Lippolt developed only a small portion of his vast holdings. As it turned out, two years after he died, his widow Marion Washburn Lippolt, a Ridgebury native, sold 570 acres to the town at the modest price of around $5,000 an acre; she could have sold to a developer, but she knew her husband loved the land. Mrs. Lippolt died in 1984. The “Lippolt property,” as it was first known, became the Hemlock Hills and Pine Mountain refuges. The Hemlock Hills section included a few dirt roads that Otto Lippolt had created in preparation for subdividing; some roads even had drainage culverts that still function more than a half century later. Wildflowers, including rare Bottle Gentians and Ladies’ Tresses orchids, sprang up in the middle of some of these dirt roads and at an old sand quarry. The main dirt road through the Hemlock Hills tract existed long before Lippolt. Bogus Road, the northern part of which is now a paved town road, ran down to the area of Lake Windwing, and was used by the British as they marched from the burning of Danbury south to Ridgefield village and the Battle of Ridgefield on their back back to their ships at Compo in Westport. 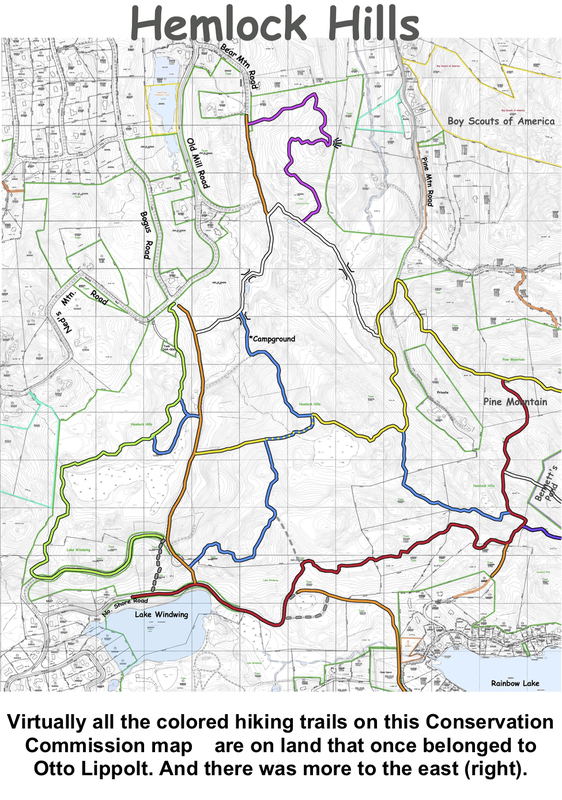 Today, Hemlock Hills and the Pine Mountain Refuges are part of the largest contiguous piece of open space in Ridgefield and one of the largest in Fairfield County. 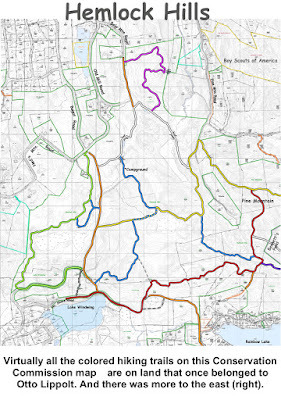 Its trails connect to a large parkland in Danbury and Bethel.